It’s another game day here at spalanz.com, and today I thought I’d deviate from the norm, and ramble a little more than usual in what may turn out to be a shorter blog. It’s something that I’ve been thinking about a lot lately, at any rate, so why not! Long-term readers of this blog, aside from being a handsome bunch, will no doubt be aware of the fact that I moved house recently. I actually bought a house, which itself is something of an achievement, of course! But it comes with a lot of attendant responsibility, naturally, and the particular house that I’ve moved to has been in need of a little work. It’s not falling apart, but it’s not how I’d like it, you know? Anyway. I guess my energy has been channeled into that, leaving me with very little time for anything else. It may be that increased sense of responsibility, or the increased financial responsibility if nothing else, but I’m finding myself with no real time – and crucially, no real inclination – to play games. In the couple of months since I started packing up my life, I’ve managed three games of Warhammer 40k, which in itself, is an intriguing achievement, but nothing else. Part of the reason for this, I feel, is that I’m still getting the measure of the new place, and where I can do things. The dining table that I used to play on, which used to be sat in front of a window in my old flat, is now in a comparatively darker corner, and doesn’t lend itself well to long gaming sessions. 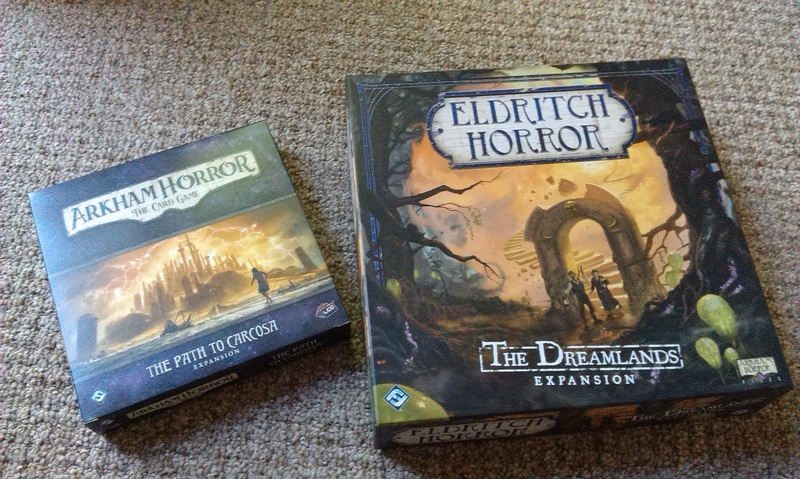 In a recent effort to combat this, however, I bought myself The Dreamlands expansion for Eldritch Horror, which has of course been out for a number of months now, but which I hadn’t yet managed to pick up. I thought, getting myself something I’d thought about for a while, for a game that I do very much enjoy, might bring me out of this gaming funk. However, after a week sat at the top of my stairs, I’ve now put it away with the other expansions for that game, largely unlooked-at. It’s a similar story with Path to Carcosa, which I’d picked up the other week in an effort to kick-start my campaign idea for the Arkham Horror LCG, but which has also remained unopened since I bought it. I suppose this could well just be me over-reacting to a temporary situation, as I try to readjust to the new surroundings and stuff. I do have walls to paint and a kitchen to replace, and have been spending more time at DIY stores than I have been with games, but once the house is more to my liking, I’d guess I’ll be back to it. I’m having some vague ideas about trying to get my girlfriend into playing some games, so that could also be an opening. The new Magic set, Ixalan, is releasing on Friday, and while I’ve been a bit out of things during the last few months with Amonkhet block going on, I have perked up some more at the thought of vampires and pirates and dinosaurs all running around, so if nothing else, I’m hopeful that I can get some more decks built and see some more cards played! Hope you find the time for your hobbies and passion mate, life is difficult at most times, we have to sometimes make space/time to switch of a bit. Rock on and good luck. Partners who game together tend to stay together. Thanks! I hope so too – though like you say, sometimes it’s good to take a step back for a while before throwing yourself back into the fray! Next Next post: My tabletop update!